Every once in awhile I like to post a few of the best things I’ve read around the web. Here are my favorite reads from the past two weeks. And yes, the last post is just more pictures of a cute stinking baby with puppies (adorable alert) all around him. Enjoy! Stop Reading All Personal Finance Blogs Now! – Thousandaire – Kevin brings some humor the world of PF and reminds us that finance truly does have a large personal aspect. In Praise of the Side Gig – Jean Chatzky – Jean graciously allowed me to write a guest post on her site last week. This was one of my more enjoyable posts because I love having my hands in a few different areas. Side gigs are a ton of fun and can help you become more financially secure. The Nielsen of Amazon Orders – Forbes by Clare O’ Connor – I’m really into startup companies and good customer service. StellaService combines both because they are evaluating the customer service of giant companies. Cool story. Maps That Will Change the Way You See the World – Slightly Warped – I like a good map. Here are a bunch of interesting statistics drawn up in map form. Pictures of a Baby with Puppies – This is obviously not a financially related link. But here are some pics of the two cutest things of the world snuggling up together, babies and puppies. Soak in the cuteness! That picture is too cute. Plus I have a French Bulldog so it makes my heart melt even more! 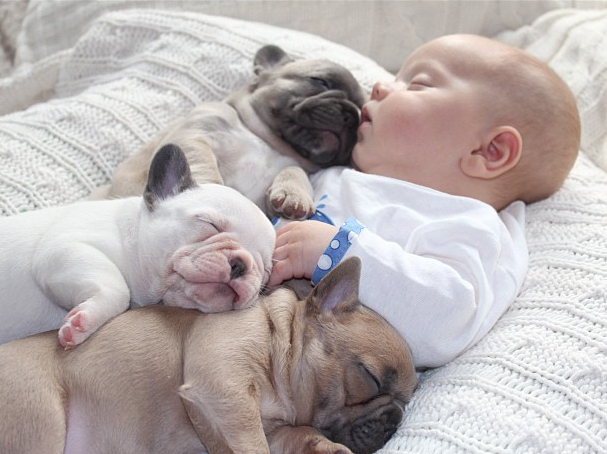 Is there anything cuter than puppies and babies together? I think not.